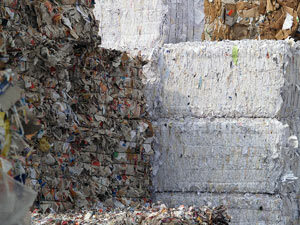 Americans have been recycling paper for more than 300 years. What started out as a small movement has grown to extraordinary proportions. Today Americans recover 67.2 percent of the paper they consume. That recovered paper goes back into new products we use everyday – like newspapers, corrugated containers, grocery bags, cereal boxes and office paper. To build on this success, the U.S. paper industry has set a goal to recover 70 percent of all paper consumed in the U.S. by 2020. While we are well on our way, there is more to be done. The average office worker in the U.S. uses 10,000 sheets of copy paper each year. That’s 4 million tons of copy paper used annually. Office workers in the U.S. generate approximately 2 pounds of paper and paperboard products every day. While great strides have been made in the recovery of several grades of paper, including corrugated (cardboard) and newsprint, one area with the opportunity for improvement is the high-quality fiber found in offices. In workplaces across America, nearly 16.6 million tons of printing-writing papers were recovered in 2007, up from more than 10 million tons in 1995. 2007 marked the high water mark for the industry, with those numbers declining to just over 11 million tons in 2015, a 33% decrease! This is where AccuShred can help. In addition to providing high-quality secure document destruction, AccuShred remains committed to the growing need for Paper Recycling. One hundred percent of the sensitive information we shred is sent to paper mills for recycling purposes. The destroyed information is turned into tissue paper and other household paper products. AccuShred, in conjunction with State Paper and Metal (our parent company), recycles 70 million pounds of paper a year. This has saved nearly 600,000 trees annually!